My-Alia : Alia the Finger Sucker! Erm.. It has been quite some time since I last update this page. Sorry. I was so hooked up with the Special Science Day Programme at PSN for 2 days. And for those 2 days too, i had a fever.. Adoi! So I guess that sort of summarise everything eh? Haha..
Eventhough i was down with fever, luckily Mak Uda is around to help me taking care of Alia..
Today, we (Mommy ALia, Ayah ALia and ALia) went to KMM, Melaka to pick Auntie Su-who has just finished her one-year matriculation there. 6By the way, ALia is really into this right now (finger sucking!) 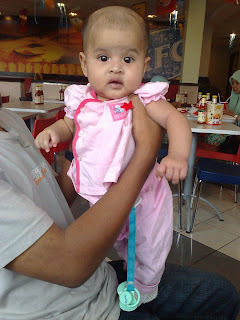 Nyam..Nyam..
yeay, mak ngah dah baik demam! Heheh.. nampak da besar..? ALia kan Photogenic..? 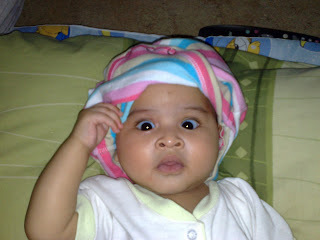 heheh..
hish....pnt tol la ajar mak alia ni ckp..